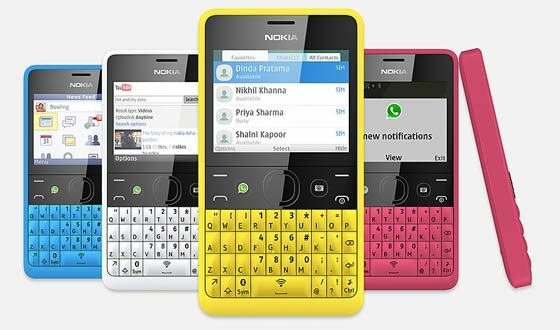 Nokia teased this new entry level phone on Monday with an oblique close-up which mainly showed a QWERTY keyboard. Today the Nokia Asha 210 was revealed in full. It’s Nokia’s latest entry-level handset and won’t be arriving in the US but many territories in Europe, Latin America, Asia and Africa will get this phone. Nokia says this is the world’s first phone with a dedicated WhatsApp button. It will also be available in single and dual-SIM variants. The dedicated WhatsApp button combined with a QWERTY keyboard may be very welcome to a large segment of the market. Normally WhatsApp is free for a year and then users are asked to pay a subscription fee, however Nokia has confirmed the service will be “free on all Nokia Asha 210 devices with the WhatsApp button for their lifespan”. Other social apps such as Facebook and Twitter and popular email services are also supported by the Asha 210. Further features of this new QWERTY phone include; a dedicated camera button to use the 2MP camera. Interestingly Nokia have a software solution to the taking your own picture problem when using a back mounted camera; “The self-portrait feature gives you voice-guidance on where to point to make sure your face is in the frame.” The screen of the Asha 210 is 2.4-inches in diagonal and 320x240 pixels. Storage can be supplemented with a microSD card up to 32GB in capacity. Nokia Slam technology is provided for quick sharing (without pairing) via Bluetooth. While the phone offers switchable Wi-Fi it doesn’t offer 3G connectivity. Nokia says its Xpress Browser uses cloud based compression to reduce data consumption by up to 90 per cent. As a side-effect of these non-3G radios and the smaller screen the battery life of the single SIM Asha 210 is said to be an impressive 46 days on standby (24 days for the dual SIM variant) with a talk time of 12 hours and music playback time of 40 hours. Looking at the physical properties of the phone now, the Asha 210 weighs 97g and measures 111.5 x 60 x 11.8 mm. Cnet describe the polycarbonate construction of the Asha 210 as having a pleasant “chalky texture”. It will be available in an eye-catching selection of colours; yellow, cyan, black, magenta and white. After reading the press release and the official Nokia blog about the new Asha 210 it was confusing to hear that the company seem to have decided not to feature WhatsApp as the dedicated button in some markets. Choosing to have a dedicated Weibo button for China sounds smart but it seems like Europe and Latin America will get a Facebook button while all the other announced markets will get the WhatsApp button and subscription free service – according to information on c-net.